Have you ever roasted nuts with spices and been disappointed that the flavourings stay at the bottom of the bowl (instead of on the nuts)? Then this week’s recipe is just for you! Recently I was inspired to try out a new method I’d read about from the very clever Emma Knowles in Australian Gourmet Traveller Magazine. Basically the secret is to use egg white to bind the flavourings onto the nuts. It also helps the nuts stick together into crunchy clusters. And even better, it gives a fine crunchy coating, instead of the oily vibe you normally get from oil roasted nuts. So delish! I just love love love the flavour of smoked paprika and rosemary together but can’t take credit for the idea. This was inspired by the roast nuts in the fab cookbook from little Sydney cafe, Cornersmith. 1. Preheat your oven to 180C (350F). In a medium bowl whisk egg white until frothy using a hand whisk or stick blender – no need to get your stand mixer out for this job. 2. Add rosemary, salt, almonds and smoked paprika. Toss until well combined. The fat from the nuts will deflate most of the bubbles from the egg white so don’t expect it to look meringuey. 3. Spread almond mixture on a baking tray (I line mine with baking paper for easier clean up). 4. Bake for 10 minutes. Check and stir. 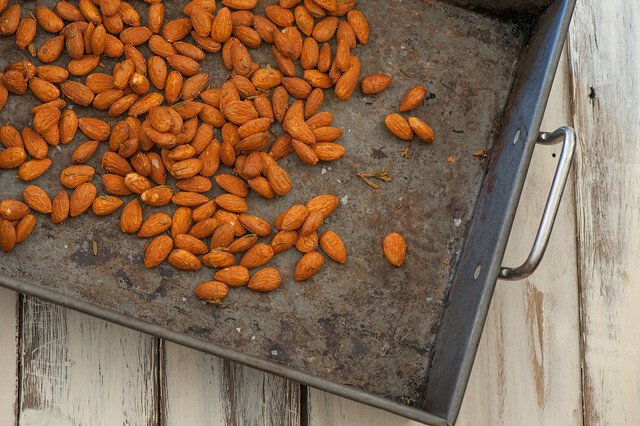 If almonds taste toasted, remove from the heat. If you like a darker roast leave in for another 5 minutes or so. 5. Cool. Store in an airtight container in the pantry. no smoked paprika – use regular paprika. different nuts – almonds, macadamias or brazil nuts would be the best substitutes or use a mixture. egg-free – the egg is the magic which keeps the flavourings stuck to the nuts but if you need to be egg-free replace the egg white with 2 tablespoons olive oil. Keeps for 3-4 weeks in an airtight container in the pantry or indefinitely in the freezer. If the nuts start to lose their crunch, you can freshen them up by popping back in the oven on a tray for 5 minutes or so. ps. 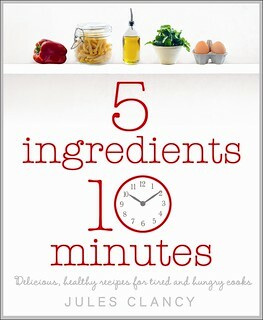 Want to win a copy of my print book ‘5-Ingredients 10-Minutes? I really want to hear from you! What have you enjoyed about Stonesoup? Do you have any ideas how I could make it better? Did you like the sound of this recipe? Let me know in the comments below. The winner for May will be judged on Monday. Sounds great but am not a fan of paprika so will try with something else such as nutmeg, cinnamon or another spice. I love my nuts and try to have then every day as they are so good for us. I change the nuts as different nuts give us different nutrients as well as variety. Hi Jules, I’ve just signed up for a year of your meal plans. Why? I had a terrible year last year with looking after my father, who died in September. I was forced into retirement at the same time. And I’m obese. It’s taken a while, but signing up to your program is a start to a better future for me and my partner. No more frozen meals, bowls of sugar laden cereals or take-aways for us! I’m also following Dr Michael Mosley’s book “the 8-week blood sugar diet” in order to reprogramme my body. Your program fits in with it perfectly as you have a low-carb option for every recipe! The recipes are so easy, fast, wholesome and delicious. I love that I’m exploring foods I would normally not eat. I’m so grateful that you’re in Australia because your menus follow our seasonally available foods. I know this is only the very beginning of my journey to better health, but I’m motivated and I’m worth it! Thank you for your part in my future, better life. Warm regards, Karen. I love your website! You’ve got great tips and recipes to try. I wonder how this trick would be on pumpkin seeds? I get your newsletter (at h2hservices) and am hoping I’m commenting in the right place to win the cookbook surprise! You asked what you are doing right… well your newsletter caught my eye and your giveaway drew me in to your site so I think you are doing great! And I’m forwarding your newsletter to my sister also. P.S. If you want to collaborate ever, let me know. I have a recipe site too and would love to feature one of your recipes there. Was planning to grill some veggies and add halloumi but my local shop was out of stock. I had my first “What would Jules do?” moment and straight away guessed you might suggest hummus instead. Grabbed a tin of chickpeas and am grateful for all Stonesoup’s variation options – you’ve finally made me feel confident and creative enough to vary recipes for myself. Theres nothing I would change about Stonesoup, have been a total convert since buying your ‘5 ingredients’ book in 2013 and several ebooks since. I’ve already given away two copies and if I won this month’s prize book I would give it away to share the word with someone else! Thanks so much Jules for all your hard work. I just joined your site and am so happy I can learn new things while cooking. Than you Jules and keep up the great work. Hi Jules: I love that your recipes have limited ingredient and take limited time. I LOVE all of the options you offer for vegan, dairy free, etc. Your recipes are neither run of the mill nor too special – they are just perfect for our regular, busy lives. There is great variety if we want it, or lots of similar stuff if we want that instead. You offer a great blend of savory and sweet, veggie and meat. I just love it – thanks! Love, love, love your site. Can’t wait to try this trick for seasoned nuts! Nuts are the best for snacking Julie! I love your site and look forward to every post! I’ve learned a simpler approach to eating — and I guess one of my favorite ideas was one you presented several (years?!) ago on making vinegar from leftover red wine. I did it and I still do it! I also like the way you casually “throw” green leaves onto foods — maybe an Australian or British thing, but not the norm here in the States. It’s perfect — why don’t we do this more? Thanks to you, I, at least, now do. glad you’re a fan of the leaves Bette! I find it’s such an easy way to get more greens and the food generally works as a dressing of sorts. I’ve seen vegan recipes for pavlova using the liquid from chickpea cans… So it seems to be a good alternative to egg white. Might be worth a try? Thanks for sharing this suggestion. I have the Cornersmith book and tried this recipe and yes I was a bit disappointed that the flavours stayed mainly in the oil. 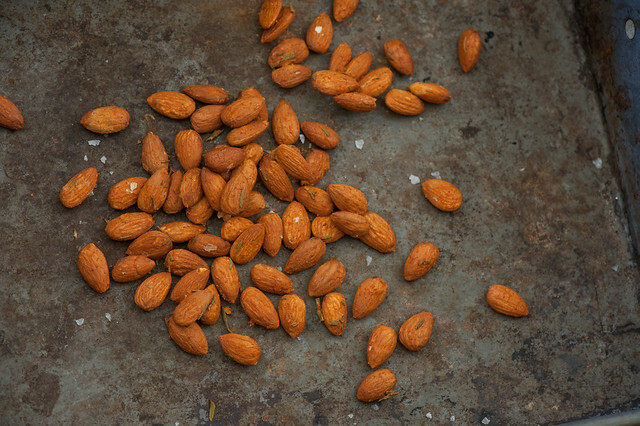 When I read your post weeks ago, I bookmarked it and today at the market I bought some raw almonds. They are roasting in my oven right now! Hey Jules, This is a trick or rather a complete recipe in itself. Roasted nuts are part of my everyday 4 clock snacking but I have always dry roasted them with some salt and butter. My favorite is lotus seeds and almonds. Adding egg to give that extra flavor and taste sounds good. I will try that. I went to the (membership warehouse store) wanting to purchase a particular trail mix we like to take on long drives to visit out of state relatives. They had not got. What else to do but make my own? I used walnuts, almonds, hazelnuts, pumpkin seeds, and chia seeds to make up the 500g nuts. For the spices I used 1/2 teaspoons each garam masala, all spice, ground cloves, and an Indian curry blend. Used pink Himalayan salt. I was so pleased with how they turned out! The egg white really made the spices and chia seeds stick to the other nuts. And tastes delicious. I plan to add dried cranberries and semisweet chocolate chips to my final mix.